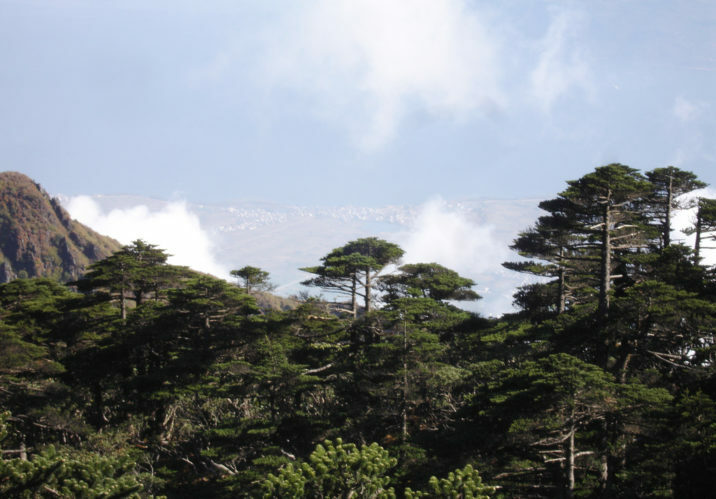 Abies delavayi, first described by Phillippe Édouard Léon van Tieghem and later by Adrien René Franchet in 1899, is commonly known as Delavay fir of 苍山冷杉 (cang shan leng shan) in the Chinese language. It was named for its discoverer, Father I.M. Delavay who collected it at 10,500 to 12,800 feet (3,500 - 4,000 m) of elevation on Cangshan near Dali in Yunnan in April of 1887. Description. Delavay fir is an evergreen coniferous tree, which will grow to a mature height of 75 feet (25 m) with rough, longitudinally splitting gray-brown bark and a pyramidal crown. Branchlets are initially red-brown or brown, then darkening in their 2nd or 3rd year; they are glabrous, rarely pubescent when young. Winter buds are globose and resinous. Leaves are spirally arranged and radially spreading, arranged in 2 lateral sets and are bright dark-green, linear, often curved or "S"-shaped, and flattened, 0.6 to 1.2 inches (1.5 - 3 cm) long by 0.07 to 0.1 inch (1.7 - 2.5 mm) wide with stomatal lines in forming two white bands. Seed cones are shortly pedunculate, black at maturity, glaucous, cylindrical or ovoid-cylindrical, 3 inches (8 cm) by 1.5 inches (4 cm) broad. Seed scales are flabellate-trapeziform in shape 0.6 by 0.75 inches (1.5 × 1.8 cm) in size. Bracts are exserted, oblong-spatulate, apex with a narrow, usually recurved cusp 0.12 to 0.2 mm (3 - 5 mm) broad. Seeds obovate; wing brown, cuneate-dolabriform. Seed pollination occurs in May with maturity in October. Distribution. This species is native to India — Arunachal Pradesh, Myanmar, and Vietnam. In China, it can be found in Yunnan province and Tibet at 7,500 to 13,000 feet (2,400 - 4,300 m) of elevation. In India it is only known from a pure stand atop Piri Mountain, within the Balipara Frontier Tract. In Myanmar and Vietnam it occurs in the north, and its Chinese/Tibetan distribution is wide through the moist mountain forests of the Four Rivers country at 10,000 to 13,000 feet (3,000 - 4,300 m) of elevation and as such includes northwestern Yunnan and southeastern Xizang provinces/Tibet around the Lancang-Nukiang (Mekong-Salween) Divide. It prefers very wet climate (annual precipitation of 30 to 100 inches [1,000 - 3,000 mm]), with cool summers and cold winters (snow on the ground from October to April). 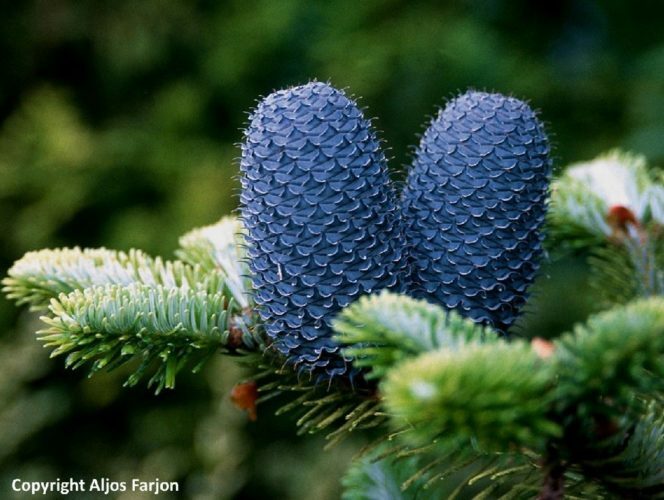 Abies delavayi — a close up of branchlet and spectacular blue cones.